The intense moments lived while visited by our brothers and sisters from the Presbyterian Church in Bethlehem, Pennsylvania, will be cherished into powerful memories. One of them was translated into a meditation for The Upper Room. Which is God’s plan for me? We are a new congregation; we started our community less than three years ago. Some of us have been Christians for a long time, others have just arrived in our community of faith, and they are giving their first steps in the way of our Lord. We don’t own a sanctuary. We celebrate our worship services in a borrowed hall and –during the week—we gather together to study the Bible at different homes. “Eleven persons from a church from abroad are coming to visit us?” ”What are they coming for? … we don’t even have a place where we can receive them”. “They want to share some activities with us, and some of them would like to help in those houses where there are needs. These brothers and sisters started reading The Upper Room because they know we are, and they wish to arrive in our city knowing a little more about us”, somebody told me. I was gladly surprised. The visitors shared our worship service and, during the week, the joined us for the Bible study in one of the neighborhoods around Buenos Aires city. When praying, one of them said: “dear fellows, we came from a church which has plenty of goods, material goods. But in these few days we’ve been witness of the love among you, how you love and care for each other. We are taking with us something we have not experienced before, and we will share this with our own community, back home”. I feel surprised. As Act 1:8 reads: we have been witnesses. I was sure we had very little to offer, and then I realized that God uses us as witnesses to people coming from far away. PRAYER: Thank you, Lord, for giving our lives a deep significance, wider than we could have possibly imagined. 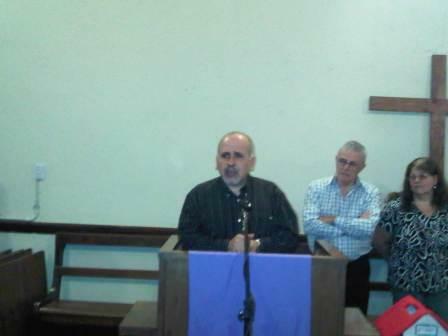 … and the pulpit was returned to Belgrano. Some years ago, there was a Methodist Church in Belgrano, at 1616 Cabildo Av., Buenos Aires. Today, under the name “Cristo Rey” it is again being used in Belgrano. 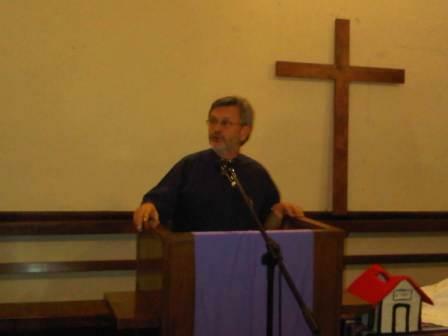 The same pulpit used in the former church was set up, last November 27th, 2010. 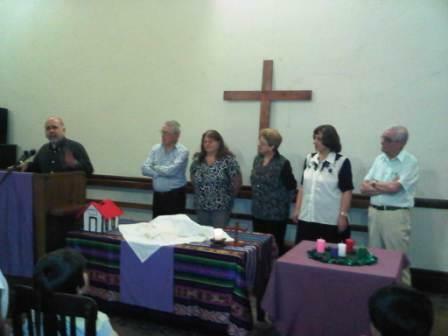 Brothers and sisters from the Methodist Church in Almagro kept it for years, and brought it back to the neighborhood. Rev. 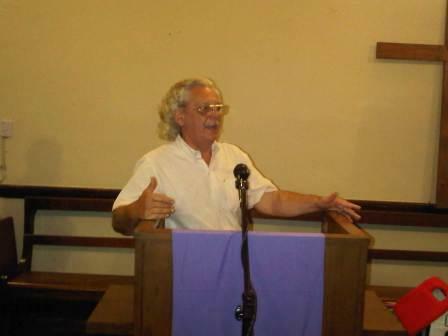 Claudio Pose, pastor at the mentioned Methodist Church, preaches at the first celebration for Advent in 2010. The President of our Board, Mr. Enrique Gabioud, expresses our gratitude. NOW, WE WILL GO ON PREACHING THE GOSPEL, WITH THE CERTAINTY OF HIS COMPANY AND POWER.